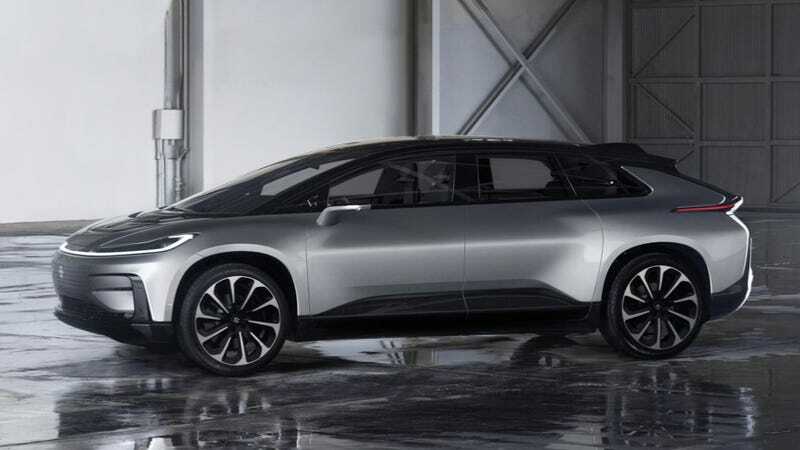 The Faraday Future FF 91 supposedly has 1,050 electric horsepower. It can go 378 miles on a charge. It can hit 60 miles per hour in 2.4 seconds. It can juice up faster than any electric car on sale today. It should actually be pretty good—if Faraday Future not only doesn’t implode first but can make anything even close to what it touted at CES tonight. Let’s just re-state for a second. One thousand fifty horsepower. Over a thousand. Do you remember when we thought the Bugatti Veyron, with 987 horsepower, had a lot of power? Now a big electric Toyota Venza-looking thing has more. We live in weird times. Of course, this is all predicated on the notion that the FF 91 actually goes into production. Faraday Future executives seem to be quitting left and right, and the company appears to be a raging catastrophe. And we still don’t know the exact date when it’s supposed to go on sale, if at all. And if you think Tesla’s going to let this shot across the bow slide, you can probably think again. The Tesla Model S has been in production for years now. The electric car wars are mildly heating up, and I’m okay with all of it.